Bonds Conway, born a slave in Virginia in 1763, was brought to Kershaw County in 1792 by his owner, Peter Conway who allowed him to hire himself out and earn money. He purchased his own freedom in 1793. Thereafter he worked as a skilled carpenter and also began to purchase land in Camden. By the time of his death, Conway owned land extending through the center of town. He built this house on that property (c. 1812). 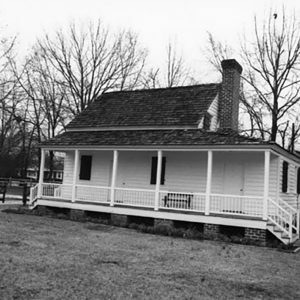 In the 1970s the Kershaw County Historical Society purchased the house, moved it to its present location, and restored it. The house is included in the Camden Historic District and is open to the public on a limited basis.